Bruce Brakenhoff at Perini Navi USA tells me he acted for the buyer in the sale of the 56m sailing yacht Zenji, a joint listing with Merle Wood at Merle Wood & Associates. 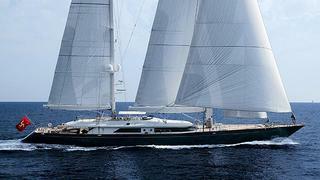 One of the newer breed of Perini Navi yachts, she was built to a Ron Holland design in 2004. MCA compliant, her satin finished cherrywood interior sleeps up to 14 guests in six staterooms while twin 1239hp Deutz engines give her a cruising speed of 11 knots. A sophisticated set of Doyle Stratis sails – new in 2009 – power her to speeds up to 16 knots and she’s extremely quite, with soles and non-structural bulkheads cushioned. Zenji was asking €26.9 million.